1) How to buy a gift voucher? We will send the voucher in PDF format to your e-mail address. We will send the voucher to an address in the Czech Republic by post. Have you not selected any gift voucher? Contact us on ticket@cnso.cz or call +420 774 377 523 and we will be happy to create for you a voucher with the desired amount. 2) How to use the vouchers? 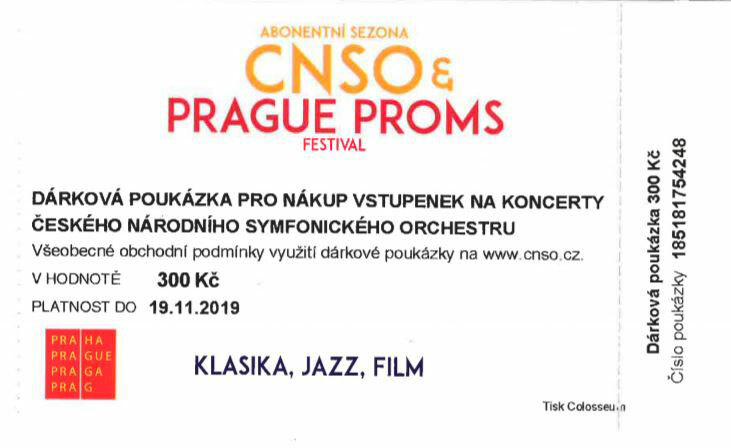 By entering the voucher number in the online shopping cart while ordering tickets for CNSO concert season or International Music Festival Prague Proms. By presenting a printed copy of the gift voucher at ČNSO, s.r.o. (Weilova 2/1144, Prague 10 – Hostivař, 102 00. Opening hours: Mon–Fri 9:30 AM – 3:30 PM. E-mail: ticket@cnso.cz, Phone: +420 774 377 523) or the Municipal House ticket office. Please pay attention to the following terms: This gift voucher is non-refundable and cannot be exchanged for cash. The validity is specified on the gift voucher. No extension to the expiry date will be permitted. The gift voucher may only be redeemed on one occasion , and to its full value. We recommend using the gift voucher to purchase tickets of the same or higher value. Any unused value on the gift voucher will not be reimbursed. More than one gift voucher may be used per purchase. Lost gift vouchers will not be reimbursed.